What resources does your small business allocate to manage finances? Are finances primarily the responsibility of the owner or manager, or do you bring in outside expertise? Do you use software, or are you still crunching numbers on paper? Small businesses use a variety of resources to fulfill the sometimes-intimidating task of accounting. The accounting resources small businesses choose determine the accuracy of their financial records, especially as these businesses grow. 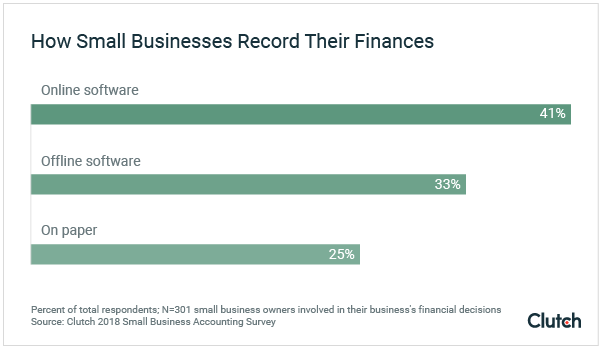 Clutch surveyed 302 small business owners or managers who are involved in their businesses’ financial decisions to discover whether small businesses invest in accounting resources, who is responsible for managing small business finances, and which software is most popular. Use this report to help choose which resources you need to master your small business accounting. 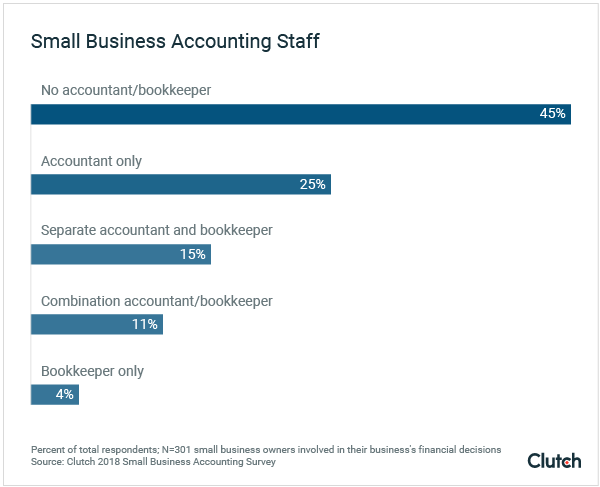 Almost half of small businesses (45%) employ neither an accountant nor a bookkeeper. Among companies that employ accounting staff, the largest percentage (22%) employ a full- or part-time outsourced accountant. For nearly three-quarters of small businesses (72%), one person handles both HR and accounting responsibilities, though this is more common among small businesses with 10 or fewer employees. One-quarter of small businesses (25%) still record their finances on paper, instead of on a computer. Over half of small businesses (53%) use an accounting software solution, such as QuickBooks or Microsoft Dynamics GP. QuickBooks is the most popular accounting software; three-quarters of small businesses (74%) use it. Many small businesses employ minimal accounting staff, potentially causing their financial records to suffer. Nearly half of small businesses (45%) do not employ an accountant or a bookkeeper. A bookkeeper maintains the straightforward records of day-to-day financial transactions. An accountant analyzes financial records and produces reports, providing a big picture perspective that guides financial decisions. Many small businesses believe they lack the budget necessary to employ accounting staff, even though they can benefit from an accountant’s expertise. Wanda Medina is a managing partner at Maventri, a full-service digital firm providing accounting, marketing, and administrative support services. She believes that most small businesses should have at least a bookkeeper. “It doesn’t matter how small a company is – if you already have two employees, hire a bookkeeper,” Medina said. Bookkeepers are valuable in their ability to meticulously keep track of income and expenses, minimizing errors. Bookkeepers also assist with issuing invoices and payroll, among other tasks. 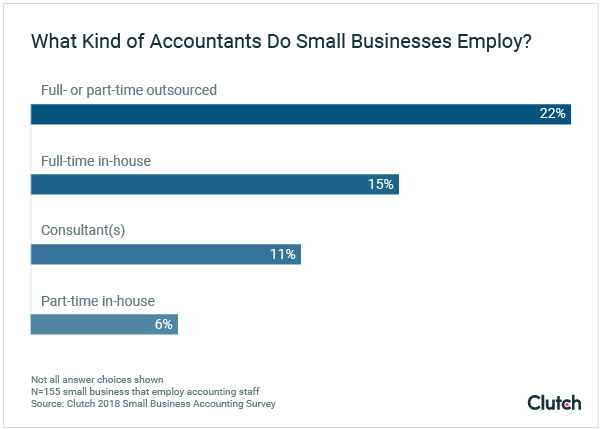 Among small businesses that have an accountant, nearly one-quarter (22%) employ a full- or part-time outsourced accountant. Jon Kline is the owner of MKE Production Rental, a small A/V equipment rental business. He finds the prospect of doing his business’s accounting himself daunting. “I tried to do my books myself, but I found myself dreading it and putting it off,” Kline said. Eventually, Kline invested in hiring a bookkeeper and accountant. “I am a lot more effective putting my time into other areas of my business, so it’s easy to justify hiring help for my weak spots,” he said. For many small business owners, investing in outside accounting help is a worthwhile alternative to struggling through a task they don’t fully understand. Outsourcing can reduce the cost of hiring in-house small business accounting staff. Some small businesses can’t afford to hire enough in-house staff to fill skills gaps. “Most small businesses need a combination of a controller, an accounting manager, and a [bookkeeper],” said Rhett Molitor, co-founder of Basis 365 Accounting, a cloud-based accounting service. "How do you get that? You can't really hire part-timers for each level of skill, so you hire the highest level and overpay. Small businesses may not be able to afford that, so we usually see them under-hire." Instead, outsourcing allows small business owners to hire the talent they need, when they need it. Outsourcing may also provide more stability for a business’s accounting resources. “Business owners often do not consider the time it takes to hire and replace internal accounting-related employees and the significant business interruptions that happen when turnover occurs,” said Dennis Theis, principal in the audit department at Maner Costerisan, a full-service public accounting and business advisory firm. With outsourcing, it’s often instead the outside company’s responsibility to replace talent when they leave. Even if you feel comfortable completing accounting tasks, outsourced help can support your long-term goals. “[Outsourcing] can also benefit companies that don’t know how to meet their growth goals,” said Donna Conte, service area leader for accounting services at Warren Averett, a full service accounting and advisory firm. Outsourced accountants may help you develop a strategy and hold you accountable to your goals, Conte explained. Outsourcing can ensure you have the accounting skills you need at an affordable cost. Small businesses see human resources (HR) and accounting as interlinking jobs, even though they require vastly different skills and knowledge. For nearly three-quarters of small businesses (72%), one person handles both accounting and HR responsibilities. It’s more common for smaller businesses to combine HR and accounting responsibilities. Nearly 4 out of 5 businesses with 1-10 employees (76%) combine accounting and HR roles, compared to only 59% of companies with more than 10 employees. According to experts, it’s often the accountant who ends up taking on HR tasks, despite having little experience. While accounting and HR overlap for payroll, HR also requires knowledge of recruiting, benefits, and career paths. Accountants typically are not trained for these tasks. This overlap of responsibilities can lead to significant challenges. A survey by ADP, a provider of human resources management software and services, found that 70% of smaller companies have an “ad hoc HR manager,” or aHRM. aHRMs are employees who take on the responsibilities of an HR manager in addition to their daily job. Of these aHRMs, only 1 in 5 believe that they can successfully execute their HR responsibilities without making a mistake. Companies that lack HR knowledge and skills can face serious consequences. These heavy topics require specialized knowledge and skills. If a business takes HR lightly by not hiring the proper expertise, it can lead to trouble. This is especially critical for small businesses that are approaching the 50+ employee threshold. Once a business reaches 50 employees, the Family Medical Leave Act (FMLA) and Affordable Care Act (ACA) start applying – bringing more legal issues into play. If your business haphazardly is combining HR and accounting responsibilities, you should consider seeking outside expertise for one or both roles. Accounting software can make crunching numbers and keeping records easier for small businesses but not all use it. We found that 41% of small businesses use software that requires an internet connection to record finances. Examples include QuickBooks Online or Xero. One-third of companies (33%), however, record finances using a solution that does not require an internet connection. Altogether, more than half of small businesses (53%) regularly use accounting software. Accounting software is often uniquely suited to help small businesses. Some accounting software can be purchased for as little as $10/month or less. Small businesses with even the most limited budgets can often find an accounting software that fits their needs and price range. Surprisingly, we found that one-quarter of small businesses (25%) still record their finances on paper. Recording finances on paper, also known as manual accounting, can be easier and more cost-efficient for the smallest of businesses. If you are still recording finances on paper, you should consider upgrading to a computer-based or online accounting system. 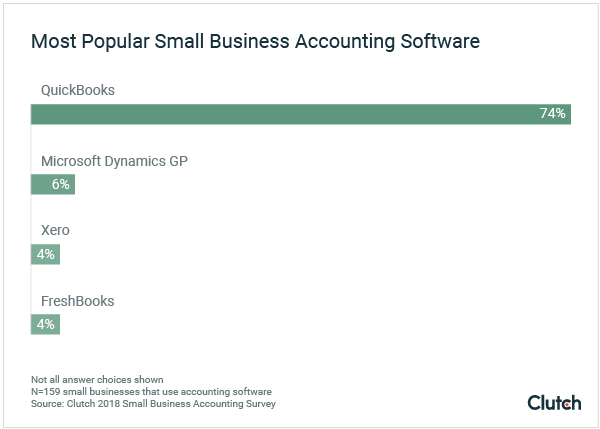 QuickBooks reigns as the top accounting software among small businesses. Nearly three-quarters of small businesses (74%) primarily use QuickBooks. All other accounting software included in the survey have 6% use or lower. Small businesses may see QuickBooks’ omnipresence as a benefit, considering so many people already have the skills required to use it. Other software solutions may require further training if the accountants or small businesses aren’t familiar with them. Jon Fasoli, director of product management at Intuit, the software company behind QuickBooks, says it’s not surprising that so many small businesses rely on QuickBooks. Small businesses use QuickBooks because it was created with their needs in mind. QuickBooks also maintains significant name recognition and longevity; the software first launched in 1992 and already had 84% of the retail accounting software market share by 1998. Regardless of brand, most accounting software can streamline accounting processes for small businesses. Small businesses with limited budgets and manpower often keep minimal accounting staff. Nearly half of small businesses (45%) have neither an accountant nor a bookkeeper, but outsourcing can provide affordable talent. Small businesses may also cut costs by combining HR and accounting responsibilities. Since both HR and accounting require significant expertise, this can lead to confusion and even legal trouble. Overall, businesses that use accounting software prefer online-based solutions, though one-third use offline software to record finances and a full quarter still record their finances on paper. Paper, or manual accounting, is not recommended given its greater risk for error and loss. From the beginning, small businesses must consider the resources they need to completely their accounting accurately.